A 7.8-magnitude earthquake and a series of powerful aftershocks left thousands stranded in a New Zealand town near the quake's epicenter. A local state of emergency has been declared for the region of Canterbury, which is home to the areas hardest hit by the quake. Helicopters are being sent to airlift trapped tourists and locals from cut-off communities in the Hurunui and Kaikoura districts. 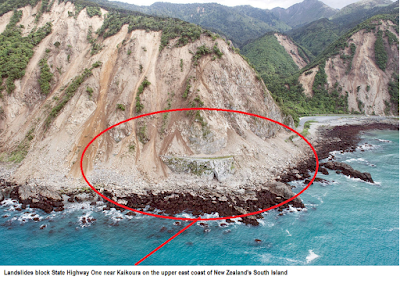 There have been between 80,000 to 100,000 landslides since the main quake with areas of the Inland and Seaward Kaikoura Ranges the most affected. As a results, a number of roads are closed indefinitely. When did this earthquake occur? Where was the epicenter of the earthquake? Who are affected by this earthquake? Why was the earthquake damaging? 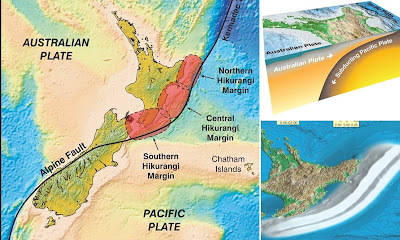 Watch the video below showing how the earthquake uplifted the coastline of New Zealand as well as the other impacts of the earthquake. New Zealand is located at the plate boundary between the Australian plate and the Pacific plate. Reflect on how this will result in earthquakes. 0 Response to "Earthquake struck New Zealand"